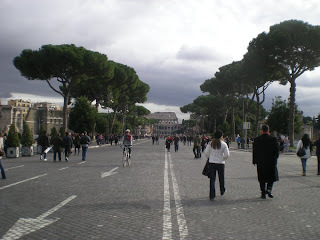 I got to spend a day in Rome this past week on a layover. 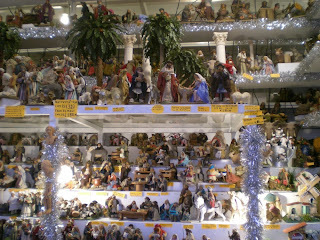 Christmas in Rome is all about the Nativity. 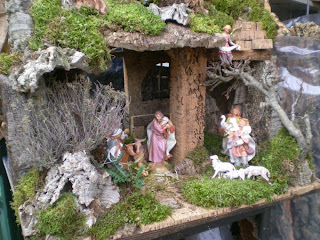 There are Nativity scenes set up in all the major plazas and in front of the churches around town. 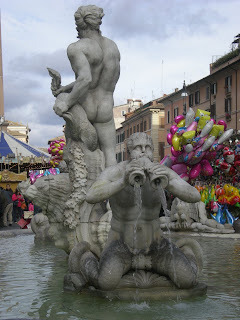 In December Piazza Navona, is transformed into a huge Christmas market. A large nativity scene is in the square. Stalls sell all kinds of Christmas nativity figures, decorations, candy and gifts. There's a merry-go-round and Babbo Natale, Santa Claus is also there. The lady with him is not Mrs. Claus, she is La Befana. La Befana is who delivers presents to children in Italy on Epiphany, much like our Santa Claus. 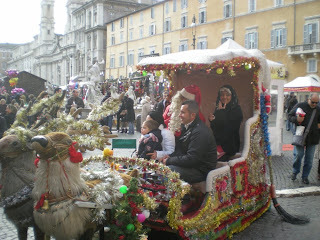 In Piazza Navona, you could get your photo taken with Babbo Natale and La Befana. Christian legend has it that The Magi asked La Befana where the baby Jesus was, but she did not know. She provided them with shelter for a night. They invited her to join them on the journey to find the baby Jesus, but she declined, stating she was too busy with her housework. Later, La Befana had a change of heart,and went looking for the baby Jesus. 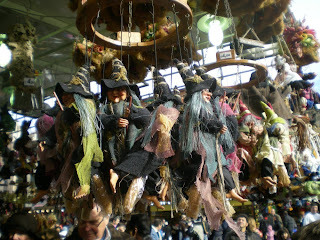 Befana still searches today, on Epiphany, Befana comes to a house where there is a child and leaves a gift. Befana looks like a witch. And like for Santa, the italian children leave a snack for Befana! The child's family typically leaves a small glass of wine and a plate with a few morsels of food. 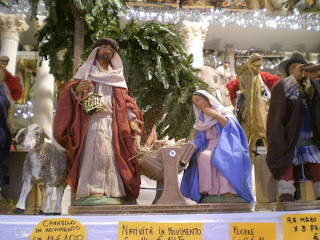 The Piazza Navonna was filled with places to purchase nativity stuff. 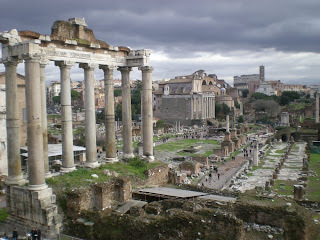 Like furnishing dollhouses or building a model train layout. 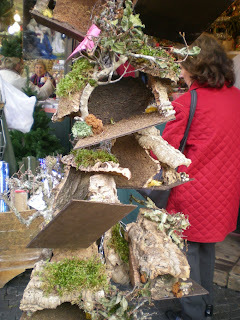 There were all sorts of things to put together to build your own nativity. 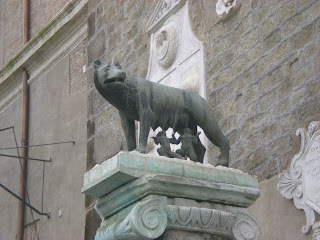 I also walked around town to see my favorite tourist attractions in Rome. 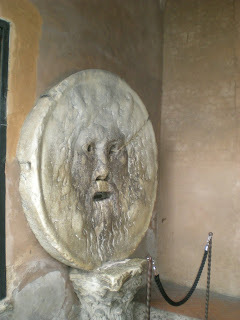 The mouth of truth, La Bocca della Verità, is my favorite. 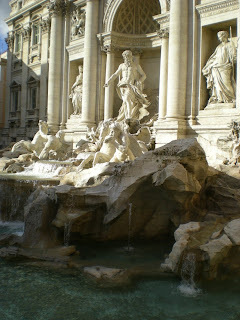 Anyone who had seen Roman Holiday with Gregory Peck and Audrey Hepburn is familiar with this sculpture. Chestnuts roasting on an open fire! Why don't I see this in the USA more? 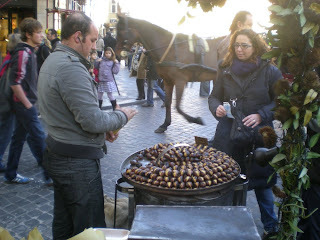 I can't resist roasted chestnuts! So yummy, hot and served in a paper cone. 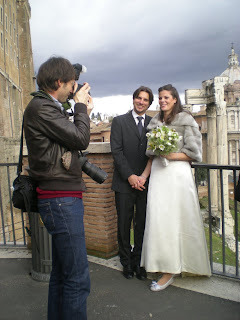 I also walked by the forum, where I saw this bride and groom getting their wedding photos taken! I love spending Christmas at home and luckily we have Seattle layovers during the holidays, so I can combine work with pleasure! Last week I was supposed to work a flight to Paris, but the Seattle to Philadelphia flight had a mechanical and I was forced to stay home. I made lemons out of lemonade by going down to Alki Beach to see the Christmas Ships. Onboard the ships, they have choirs singing Christmas Carols and on the shore there is a bonfire and often the local Starbucks will be providing hot drinks. You can pay to ride on the ships and even have dinner. Or if you have your own boat, you can put lights all over it and come along, making it a lighted boat parade! It is great fun to go out and see the lighted ships come up to shore and hear the music. 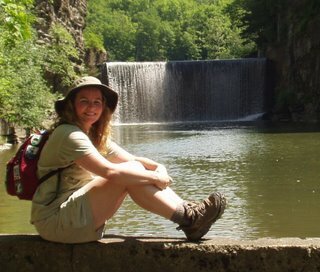 This week, I was home on a layover and I was supposed to work the flight back to Philadelphia overnight. However, the major snow storms on the east coast forced the airline to cancel our flight and I got to spend another evening at home. 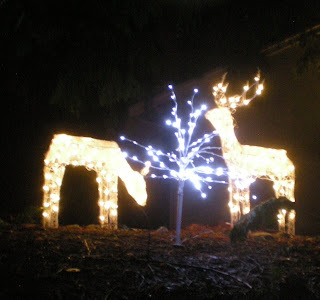 Again in an effort to make lemons out of lemonade, I took an evening stroll around my neighborhood to see the Christmas Lights! 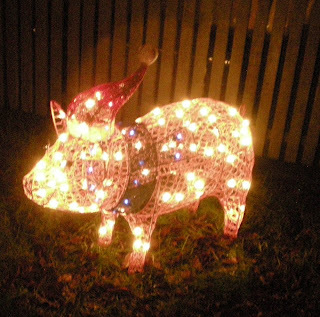 My neighborhood is always full of lights during the holidays, almost every house is covered in colored lights and the yard displays are wonderfully fun! There is lots of variety. 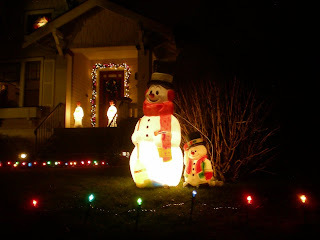 This year there is also a house that has one of those systems that matches the lights to music. You can watch the lights flash around to Christmas Songs. Here are a couple of videos of that house! Some of my favorite house displays have more retro decorations. 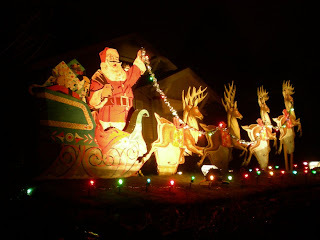 I love this Santa with his sleigh and reindeer! 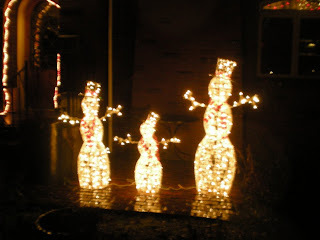 And these cute little snowmen.